Top-Edge Roofing & Exteriors is an authorized dealer and installer of Moderne Slate Shingles. 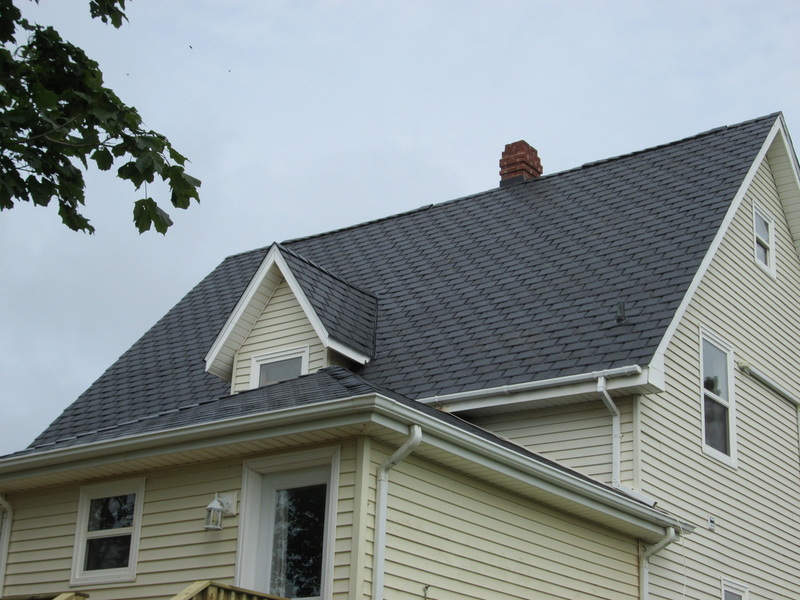 Moderne Slate shingles are fast becoming the premium industry standard, because of their striking appearance, remarkable strength, environmental value.....and highly competitive pricing. Beginning with the highest available grade of recycled plastic, the only 'extras' added to the feedstock before manufacturing begins are a highly-advanced fire retardant, and the coloring chosen for that production run. Inside the 'state-of-the art' injection-molding systems are a trio of unique surface patterns, made from quarried natural slate tooling. This means shingles are produced in a choice of four stylish colors and three natural slate surfaces – Full Square, Scallop Round and Fangate. If you prefer, these patterns can be mixed in any combination on your finished roof…. and many of our customers do just that. This product is manufactured right here in the Maritimes! The production plant is located in Minto, New Brunswick. The product comes with a lifetime transferable warranty. For more information on this product, you can visit their website at www.moderneslate.ca or contact us.